A complete step by step tutorial on How to download Arduino Library for Proteus ISIS. Hello friends, hope you all are fine. In today’s post, I am going to share Arduino Library for Proteus. I am quite excited about today’s post as its my first complete Arduino Library for Proteus. In my previous posts, I have shared these boards in separate libraries but today I am gonna combine all the boards together in single library so that you just simple install this library in your Proteus software and you get all the boards in your Proteus workspace. You must also give a try to Genuino Library for Proteus. I have already posted few other Arduino Libraries on my blog but those were third party Libraries and has nothing to do with us. We were sharing them just for the sake of knowledge but today I am going to share our very own Arduino library for Proteus, designed by our team after a lot of hard work. We have tested all the boards with different types of hardware and there’s not a single bug present in it. So, now you can easily use Arduino boards in Proteus and can simulate any kind of project in Proteus. If you got any trouble then you can ask in comments or can use our Ask Question forum to post your questions. So, I hope you are gonna like and enjoy today’s post quite a lot. So, let’s get started with Arduino Library for Proteus. Ultrasonic Sensor Library for Proteus. Flame Sensor Library for Proteus. When you download it, you will get a zip file. so, unzip this file and you will get two files in it. These two files are named as ArduinoTEP.LIB and ArduinoTEP.IDX. Copy these two files and place them in the libraries folder of your Proteus software. If you are unable to add Library in Proteus 7 or 8 Professional, then you should have a look at How to add new Library in Proteus 8. These are all the boards designed by our team in Arduino Library for Proteus. So, these are the boards, which you can use in this Arduino Library for Proteus. There’s one board missing in this figure which is Arduino Mega 1280, because its same as Arduino Mega 2560 so I haven’t posted it here but its included in the library. So, now you have all the Arduino board in your Proteus software and you can simulate them as you want them. 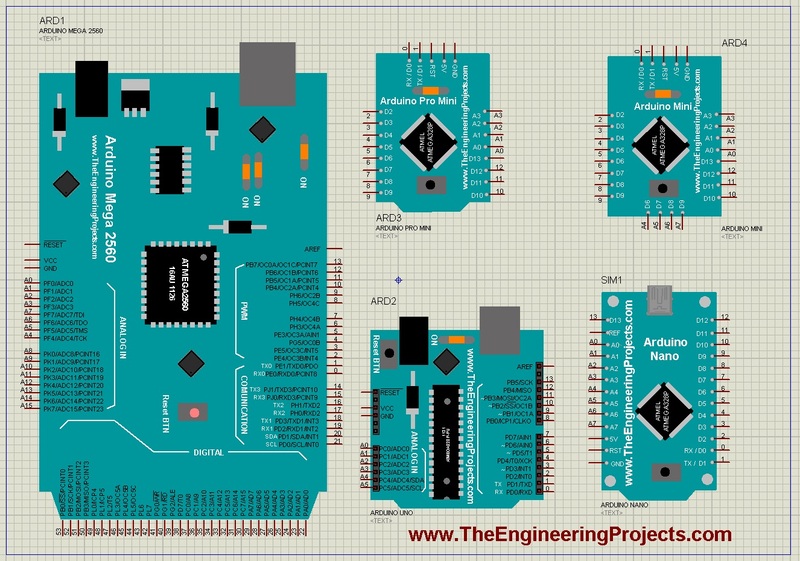 Let’s design a simple Arduino UNO led blinking circuit for better understanding. 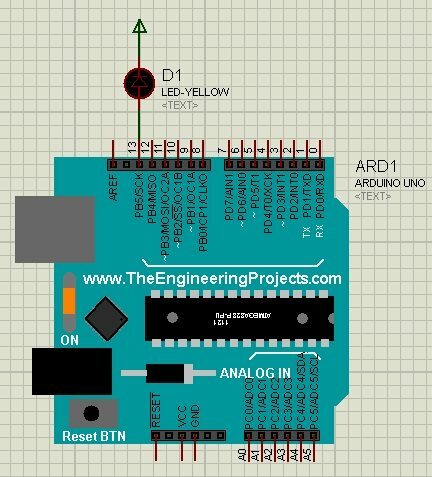 Now open your Arduino software and open the LED blinking Example and get your hex file. If you don’t know about hex file then read How to get hex file from Arduino. Now upload your hex file in your Arduino board. So, now in this way, you can easily simulate any of your above mentioned Arduino boards quite easily in Proteus software using our Arduino Library for Proteus. Below is the video in which I have described this tutorial in detail so that you can get it quite easily. And great article too. Everything clearly explained by screen shots. Keep up the good work. Pls upload 12 v dc to 240 v ac inverter..using Proteus .. I am working on it but its quite difficult so its gonna take time. Its in future plan but not in the near one. (Sorry to say). Thanks sir I appreciate your work. Very informative and amazing post about “Arduino Library for Proteus”. I like your explanation way. And also like your concept of post, i will surely use this concept on my arduino project. Thanks for sharing a great post. Thank you very much Syed! I downloaded the ArduinoTEP.LIB and ArduinoTEP.IDX files according to your instructions. However, when I opened Proteus 8.0, just the Arduino Mega 2560 and the Arduino Mini models are available in the Arduino library. Why? I need the Arduino UNO, please. Its in there bro, if you are still not getting it then add me on Skype and I will help you out. i also need to download library of Arduino Due and add to proteus, i would be grateful if you help me? is there any soil moisture sensor in proteus? I need it for my project . Why ?? These files are updated one. Oh great………….good job….. interesting… keep it up. What is the difference between your Libraries ant the ones included with Proteus 8.4? You can find it in the Terminals Mode Section. I have marked it in the below figure. I’m desperate, I follow all the steps but I can not install the arduino library in proteus 8.2. I allocate files …tep.idx and …tep-lib on program data labcenter proteus and library folder but when in pick devices I type arduino dont show me the models. i am always followed you .sir i want to know how to pakaging the proteus part . so i am waiting for your +ve reply. sir embedded student , i forgotten how to add source file & create hex value. I have posted a tutorial on how to add hex file in arduino …. search it on our blog. Thanks for the fantastic proteus libraries. Is there a proteus arduino ethernet-shield (inc. SD-card) available for simulation? That would be great for testing purposes. could you plz tell me how to create proteus libraries using dll and programmatic techniques like you did with this. Please help me out I have installed proteus 8software to my laptop while opening it’s shows dxllibrary.dll error what to do now…..? i want to use nRF24L01 in proteus. Please suggest how can I add nRF24L01 to proteus library or suggest any other. I need the same library and I would like to know if you received the answer of your question. Do you received the answer? If yes, may you please send me the link to download the library? works with analog outputs pins? Its a nice piece of article and very informative. I was wondering if you can provide me solar cell library (if one exists) or at least guide me how we can mimic solar cell in Proteus. I am kind of a stuck in the middle of my project. Knowledge is always get respect every where.Thank you sir for your work. May almighty give more knowledge to do more . thank a lot friend for your valuable contribution on make sure engineer students are getting enough libraries for Proteus would like to request would you provide library module for water leakage sensor please consider that. Please how I can play an mp3 or wav type sound using an arduino uno card and a memory card that store the sound. The code if you like. Thank you in advance, I await your answer. I have copied the file onto my library. I am able to find the arduino uno but the problem is that the Vcc and Gnd terminals are not coming in the analog input side only reset is visible. hi. may i know how to get fingerprint module library for proteus?? however, if you could show how to solve the issue with binding in VSM. there are some Arduino in the proteus 8.7 that source code can be added directly to them but when trying to edit source for the provided Arduino in your library after using the wizard to add new firmware, there is an error that says Failed to bind project to an existing processor. Too bad the Nano and mini circuits are not drawn by ISIS. In Arduino nano library for Proteus, Vin pin is not there in arduino nano atmega328p,can you please suggest me how to add Vin pin.. I had to search all my computer to find that dam folder. It was in a totally ramdon place. how can i finde arduino due in proteus?? I use your library for ISIS, Arduino Nano. But when reading an analog signal using the built-in ADC in Proteus – your library produces a result that differs from the real Arduino. For example, when measuring resistance 1kOm – the library returns the result of 80, while the real Arduino reports from the Serial series – the value 500 (out of a possible 1023). If you close the + 5V wire and the analog input in the Proteus simulation – the library will return the result 1023, as expected. The algorithm of the ADC needs to be improved. Can I help with implementation? How soon are fixes possible in this library? I would be glad to communicate in all available ways. Thank you and your team for your efforts , which we appreciate it. We haven’t designed it yet, so can’t help you out. i cant see the library folder in proteus software even though i have given access to hidden folder can you pls help me. i download arduino library but problem here is that there is no Vcc and ground pin.how can i get this.